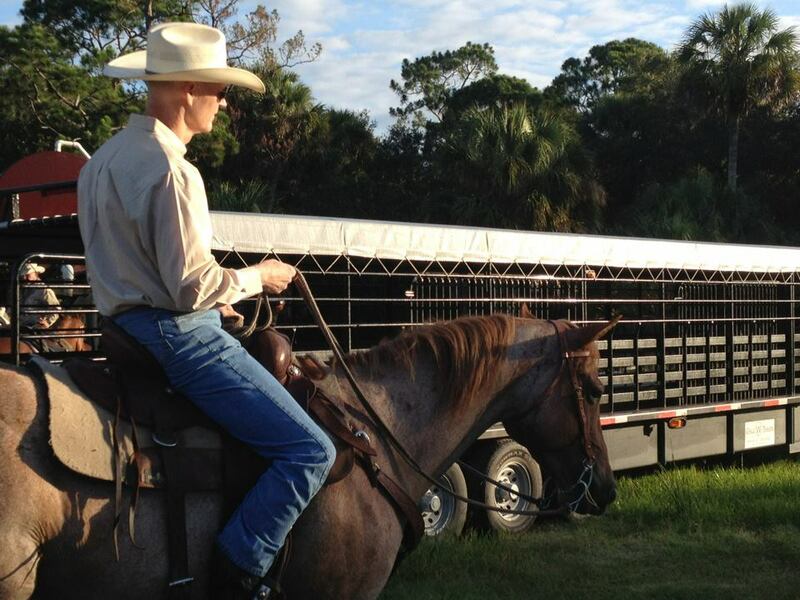 Continuing his focus on job creation and promoting Florida’s agriculture industry, Governor Rick Scott spent his tenth ‘Let’s Get to Work’ Day as a ranch hand with the Williamson Cattle Company in Okeechobee. The multi-generational family operation is managed by the fourth generation of the Williamson family and includes many second and third-generation employees. Saddling his horse around 7 a.m., Governor Scott began the day rounding up cattle from some of the operation’s roughly 10,000 acres and herding them into cow pens. He helped select cattle to be sold at market later in the day, as well as weighed and administered de-worming medicine to calves. Before breaking for a lunch of barbecued beef brisket, the Governor assisted with building and mending fences. During the afternoon, Governor Scott helped take the selected cattle to the Okeechobee Livestock Market, which has been owned and operated by the Clemons family for three generations. While at the largest livestock market in Florida, the Governor observed the auction and sale of cattle while meeting other ranchers from the area. Later, back at the Williamson ranch, he spent the afternoon assisting with disking pastureland with equipment pulled by a tractor and learning about center-pivot irrigation. He also hauled and unloaded mineral nutrients for cattle and rotated cattle from one pasture to another. According to the Florida Cattlemen’s Association, Florida’s cattle industry is the 11th largest in the United States with just over one million beef cows. The cattle industry supports a vast network of associated businesses, including feed companies, heavy machinery corporations and fertilizer manufacturers. This integrated web of economic organizations helps create jobs and business opportunities in Florida. The Williamson Cattle Company received environmental leadership awards from the Florida Department of Agriculture in 2003 and from the National Cattlemen’s Beef Association in 2004. Florida is in the top 11 states for beef cows, and cattle ranching has a $4-billion economic impact on the state’s economy. Florida has approximately a dozen of the largest cattle ranches, in terms of the number of cows, in the country. They are primarily cow-calf operations that produce 750,000 to 800,000 head of feeder calves a year. These calves are shipped via truck, primarily to Texas, Kansas, Nebraska, Colorado, Oklahoma and Iowa. Florida’s ranching industry consists of approximately 16,000 family-owned farms that have been in business for many generations. The first cattle in the United States arrived in Florida in 1521. At the present time, Florida has approximately 1.7 million head of beef cattle grazing on approximately 6.5 million acres throughout the state. Last year, Governor Scott started working at jobs that mirror the tasks he performed on his journey from public housing to the Governor’s Mansion. Floridians can suggest jobs for the Governor’s workdays by visiting www.FLGov.com and clicking on “’Let’s Get to Work Days’ or e-mailing Rick.Scott@eog.myflorida.com.